Fully Uniformed Chauffeurs With Hats, Elegant Rear window Floral Display, Coloured Ribbon Of Your Choice. Please call early for details. You will arrive in style ensuring that every detail of your wedding transport requirements are taken care off which leaves you free to enjoy your big day. After the celebrations, have a chauffeur driven saloon from your reception to your overnight accommodation, the perfect end of your fabulous day ! 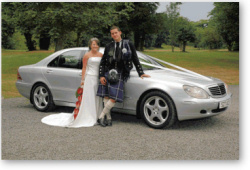 Avantgarde Bridal Cars offers a distinctive service that will compliment your wedding day. Our silver Mercedes S / E Class saloons complete with fully uniformed chauffeurs will be presented to you in immaculate condition with an elegant floral arrangement on the rear parcel shelf and silk ribbon on the front of the vehicle. Our professional and courteous Chauffeurs will transport you in style to your church ceremony, stopping off for photographs if required and then on to the reception venue. 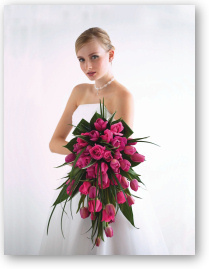 Our Services are Flexible to Accommodate the requirements of YOUR Day! We offer a reduced cost for a wedding couple who are having their ceremony and reception in the one venue, Our impeccable service remains the same but the cost is reduced because we are not required as long. Should you wish the cars to remain for photographs however the cost reverts to full price. If it is Mercedes you are after then Avantgarde have the finest selection. We have been supplying transport for weddings now for 10 years and over the last six years in excess of 100 weddings per year with the exception of 2013 where we completed only 99. OUR CARS START FROM AN AMAZING £120 !!! for any occasion call on 0131 453 1111.